The modern settee is a reproduction of old models, and certainly an improvement on the original. If this is the age of luxury, it is also the age of comfort, and though we cannot help admiring exquisite old designs, we should find them, for seating purposes, remarkably uncomfortable. When, however, the general shape of one of these fine old models is copied and improved upon - the depth of the seat increased, the height of it altered, and the pitch of the back varied-a perfect piece of furniture is the result. 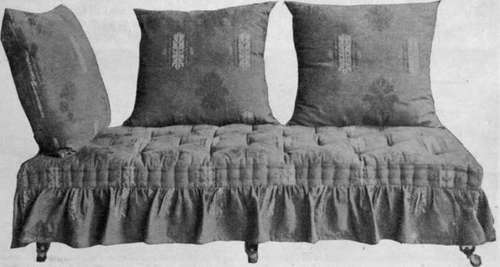 Ideas of upholstering also have changed, and the down cushions with which many settees are fitted are the very essence of restfulness. 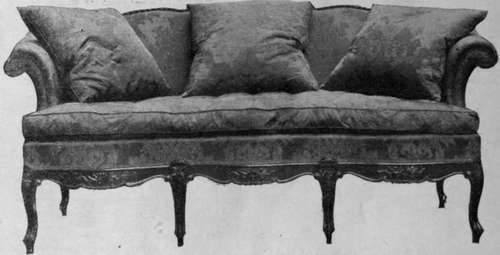 The Chesterfield was the first protest against discomfort. - Since then, however, enterprising upholsterers have evolved the infinitely more luxurious down-seated settee. This has three deep, mattress-shaped, down cushions in the seat, and a pillow back. A settee of this kind, covered with green moire, and edged with cream, is delightful in any room, and goes better with old furniture than a Chesterfield. It is best not done in chintz or printed linen, as it has a richer and more dignified appearance in brocade or moire, the colour being chosen to harmonise with the room. It seems especially adapted to stand in front of a window, but the position of a settee or sofa should always vary according to the time of year, being placed during the summer where it will get a breeze, and in the winter where the occupants can enjoy most comfortably the warmth of the fire. A similar settee is also to be had covered with leather for smoking-rooms, but it is a very great deal more expensive. This is not only because the pelt is more costly, but because the purchaser is getting the value also in better upholstery. The stuffing of the pillows is a far more difficult matter, since leather will not give like silk or tapestry, and demands a much finer class of work. Many people, however, still content themselves with a Chesterfield, and certainly its commodious seat is very inviting. Besides, it always looks well covered in one of the printed linens with a natural-coloured ground that are all the fashion. And the pattern on the linen may do something to bring this piece of furniture into keeping with its surroundings in a period room. But brocade covers are used even more than linen, as many seventeenth and eighteenth century designs are to be found which go well in Queen Anne or white drawing-rooms. Brocades are far cheaper than they used to be, a good one being obtainable at 4s. 6d. a yard. When using loose covers, it is well to choose a sofa with a lining cover which will not look amiss when the cover is at the cleaner's. A dark blue printed cotton is particularly good for this purpose, as it keeps clean a long time, and harmonises with most rooms. In state drawing-rooms one may find very elaborate and beautiful models after the Chippendale or Adams period - graceful and handsome pieces, such as should be used with good old furniture. But, again, the modern reproductions are an improvement on the actual antiques. These settees have a large down cushion covering the seat, and are upholstered in the brocade of the period, usually of a rich red or a green. As they are wide in the seat, and take up a good deal of space, they are more generally seen in large drawing-rooms of the state reception order than the comfortable sitting-room type. Then there is the seventeenth century settee to be considered. This is seldom found in a drawing-room, since such a room is but rarely decorated after this early period, as most people consider the oak which was characteristic of it too heavy for the purpose. What is known as the Knole settee, a copy of an original at Knole House, is a well-known 'piece. The actual model * is very uncomfortable, but the copies, with their modern upholstery, are quite the reverse To some people the idea of a settee, and a smaller settee, and a chair - all upholstered with silver-green velvet and silver - for an oak-panelled drawing-room will appeal very strongly, but for the most part the Knole settee is used in a big sitting-room hall. The Divan in big rooms it is usual to find, m addition to a large settee or sofa, a smaller one with a shallow seat and upright back. Such a seat is better adapted for conversational purposes. These are found in a variety of designs, according to the period that they represent. Those in walnut, with cabriole legs and a loose-covered seat, look very picturesque in a Queen Anne room. Another quite different pattern has a brocade-covered seat and back set in a narrow rim of satinwood or mahogany, and looks appropriate in any room treated in a light and dainty manner after either the English or French style, with, maybe, white panelled or grey walls. The divan is a form of lounge popular in smoking-rooms, lounges, billiard-rooms, halls, studies, and so forth - in fact, anywhere where there is no stiff and formal decoration. The divan is not only a very comfortable but a very inexpensive form of seat. One can be bought for about £5 5s., including a couple of cushions. It is really based on the Eastern lounge, and so is very wide, about 2 feet 9 inches. It has a particularly pleasing appearance put in front of a straight window, or fitted into a square bay; or it may be placed in a recess. It should be covered with some good dark shade which gives a look of comfort. A cotton tapestry will answer the purpose admirably, and a Jacobean design is a satisfactory one to choose. For a morning-room, where general utility is the question to be considered, a hinged-end settee is the ideal thing. This serves equally well for idle lounging or real resting. For the latter purpose, one end can be let right down and the other put at a comfortable angle. It is not at all a costly piece of furniture, since it is obtainable, covered in a pretty cretonne, for about £7 7s., and for this reason it is also very suitable for a girl's sitting-room. Whenever there is room in a bedroom there should be a sofa. It adds immensely to the comfort of the occupant, and should be of the box order, nicely lined with white lining. It then makes a perfect receptacle for evening gowns, as the skirt can be spread out at full length and kept quite free from dust. Such a sofa can be bought for about £1, with a 'cheap cover, and should be re-covered with cretonne to match that used in the room. The writer has also seen one covered in a dark tapestry, which looked quite charming.